Who's Profiting From the Swine Flu? Is there a war or plague these guys don't wet their beak in? The swine flu pandemic has been a dud so far, but not necessarily for Donald Rumsfeld, Hallmark, and a few other entities uncannily well-positioned to gain from the global hysteria. Who wins when we all rush out to stock up on tamiflu, surgical masks, and sympathy cards? Who are these flu-moguls and how are they getting rich from this virus? As of 2006, Rumsfeld owned stock in Gilead Sciences, Inc., the company that developed Tamiflu (now produced by Roche). 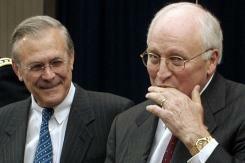 Rumsfeld was on the board of directors until he became the Secretary of Defense under George Bush. George Shultz, the one time Secretary of State was also on the board and both men maintained their investments in the company while in office -- worth more than $25 million. In late April when the flu news broke, Gilead’s stock jumped nearly 10% from $43.73 to $47.60 as over 60 countries stockpiled Tamiflu, with higher demand expected. After stacking up on canned goods at the grocery store, the next stop for many Americans is their local neighborhood gun store. Hurricane Katrina, the Virginia Tech massacre, and the election of Barack Obama all led to sales spikes of more than 10%. A similar increase can be expected as the swine flu spreads – this despite the fact that attempts at shooting the virus have so far proven largely unsuccessful. For some, the only thing worse than catching the flu is being caught without a fashionable facial filter. Japan is the clear trend setter since anyone with a cold, bad breath, or missing a tooth, is expected to wear a mask. During a pandemic it can be especially hard to stand out from the crowd, hence: designer masks from Prada, Louis Vuitton, and Armani. Beware of cheap knock-offs. North Korea, Iran, and Cuba. Suddenly those isolating sanctions and travel restrictions don’t seem so bad. As of press time, no cases of swine flu have been reported in Iran or North Korea, and only six in Cuba, which is, after all, home to the Bay of Pigs. The uncannily swift release of Hallmark’s new line of “Sorry to Hear You Caught the Swine Flu” cards are expected to the give company a much-needed boost in second quarter profits. Conspiracy theories implicating Hallmark in the spread the virus have arisen after this "coincidence” was first reported. During the End of Days, people like to be plugged in and it’s the job of outlets like Fox News and CNN to give the people what they want. During periods of high ratings, they can charge advertisers higher rates and ride the gravy train as far they can – until they pandemic ends and they have to toss a Chihuahua into a well or whatever it is they do on a slow news day. A similar group of shameless profiteers worth mentioning: bloggers in Mexico. Trust us on this one.